Marvel Studios held an event today at the El Capitan Theater in Los Angeles to make some stunning announcements revolving around their Phase Three film release slate, the details of which have mostly been the subject of rumor and conjecture until now. Studio president Kevin Feige hosted the event (with some surprise guests) and later held court at a press-only Q&A following the announcements. Movies/release dates that were announced or confirmed include Doctor Strange, Guardians of the Galaxy 2, Thor: Ragnarok, Captain America: Civil War, Black Panther (including who will play the title role), Captain Marvel, Inhumans, and a two-part Avengers titled Avengers: Infinity War. You can read a full recap of the event, and see logo images for all of these movies and an official concept art image of Black Panther below! The event began at 2:11 pm EST when Feige took the stage before a massive theater screen playing the famed Marvel Studios logo to present a screening of the teaser trailer for The Avengers: Age of Ultron that the studio was forced to premiere almost a week ahead of schedule after a poorer quality version leaked online. After the trailer director Joss Whedon made the first surprise appearance. Once the Whedon love subsided Feige thanked everyone in attendance for making Guardians of the Galaxy the number one movie of the year. Then he revealed that the third Captain America film has been locked in for a May 6, 2016 release date. It has been known for two weeks now that Robert Downey Jr. had joined the cast, getting the rumor mill working overtime with the possibility that the storyline of the sequel would adapt the Marvel Comics crossover event Civil War. This was finally confirmed when the full title of the sequel was revealed to be Captain America: Civil War. Feige later stated during the Q&A that Civil War would kick off Phase Three. Downey and Chris Evans took the stage after the release date announcement to thunderous applause. Winter Soldier directors Anthony and Joe Russo have not yet been confirmed to direct. Complete with a thank you video message from director James Gunn for the first film’s success, an untitled sequel to Guardians of the Galaxy was officially announced for a release date of May 5, 2017. The third solo adventure of the God of Thunder is just three years away. Thor: Ragnarok (“The end of all things,” according to Feige) will hit theaters on July 28, 2017. It’s official, folks. We’re getting a Black Panther movie on November 3, 2017. Chadwick Boseman (42) took the stage as he was announced to be starring as the legendary superhero known as T’Challa, ruler of the fictional African nation of Wakanda. Boseman, who will debut as the character in costume in Civil War, said that he was blessed to be a part of the Marvel Universe. As is that little surprise wasn’t enough, Inhumans is also on the way with a release date of November 2, 2018. After that announcement a montage of scenes from all of the previous Marvel movies was shown and concluded with the image of the Infinity Gauntlet. This was to confirm The Avengers: Infinity War, which will be a two-part cinematic event. Part One will be released on May 4, 2018 while Part Two follows a year later on May 3, 2019. 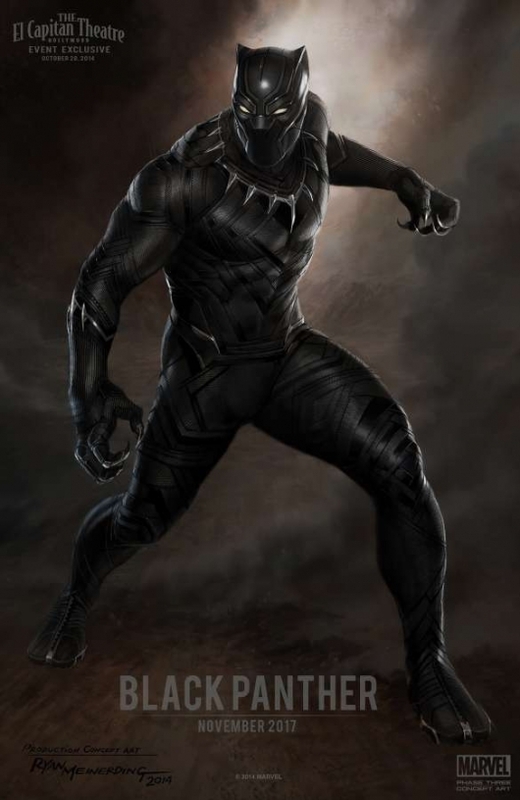 And in closing here’s a really cool piece of Black Panther character concept art released exclusive to the event. Can’t wait to see this in action on the big screen.